To his early movies belong "Der heilige Hass" (21), "Die Bestie" (22), "Das Wirtshaus im Spessart" (23) and "Die Tragödie der Entehrten" (24). He became a very popular actor from the middle of the 20's with productions like "Venezianische Liebesabenteuer" (25), "Unsere Emden" (26), "Der alte Fritz" (27), "Der Katzensteg" (27), "Artisten" (27), "Die elf Teufel" (27), "Adam und Eva" (28), "Kinder der Strasse" (28) and "Napoleon auf St. Helena" (29). 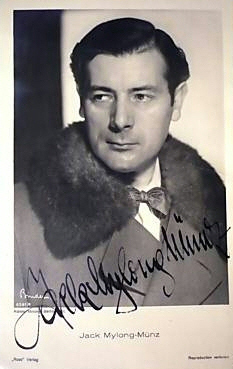 Jack Mylong-Münz could only took part in few more movies in the sound film era of the 30's like in Alfred Hitchcock's "Mary - Sir John greift ein" (30) as well as in "Der Greifer" (30), "Der Zinker" (31), "Die unsichtbare Front" (32) and "Salon Dora Green" (33) before he had to emigrate because of the political situation in Germany. He was able to continue his career in the American exile though his roles weren't as huge as in the 20's. To his movies in the 40's belong "Crossroads" (42), "For Whom the Bell Tolls - Wem die Stunde schlägt" (43), "The Story of Dr. Wassell" (44), "The Mask of Dimitrios" (44), "Hotel Berlin" (45), "Cloak and Dagger" (46), "The Perils of Pauline" (47) and "Battleground" (49). In the followed his last movies like "Young Daniel Boone" (50), "Das Haus in Montevideo" (51), "Sea Tiger" (52), "Rhapsody" (54) and "Never Say Goodbay" (56), the television became eventually more and more dominant in his career. To his last cinematical works belong the serials "I Love Lucy: Paris at Last" (56), "77 Sunset Strip: The Iron Curtain Caper" (58) and "Combat! : Finest Hour" (65).